An all-male acapella group dropped musical number "Kiss the Girl," from Disney's "The Little Mermaid" (inset), following criticisms of the song's message. 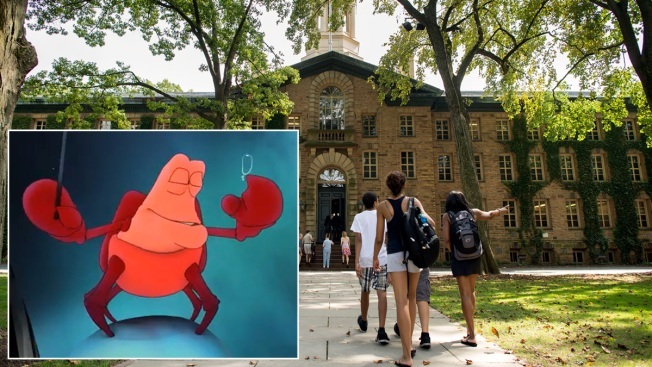 An all-male a cappella group at an Ivy League university has pulled a Disney movie song from its act following a student newspaper column that suggested the lyrics helped promote "toxic masculinity." The Princeton University Tigertones have performed "Kiss the Girl," a song from "The Little Mermaid," for years. During the performances, a female audience member would be brought onstage to decide whether or not a man from the crowd could kiss her. Noa Wollstein, who wrote the column, claimed the song's message is misogynistic and that too many women have been pulled on stage for unwanted encounters. In a response published in the newspaper, the Tigertones' president apologized to anyone made uncomfortable by the tradition. He said the group won't perform the song until it can find a way to do so without offending any audience members.